photo by Justin Reynolds City Councilmember Dana Miller: The area's diversity is a big attraction. photo by Justin Reynolds At longtime neighborhood anchor Hunt's Hardware: Bill Hunt Jr., Bill Sr., and Dave Hunt. The store has served generations of 19th Ward residents. photo by Justin Reynolds The YMCA's TeenCity program, providing crucial services to the 19th Ward. Located between the GeneseeRiver and the Erie Canal, the 19th Ward is the most diverse neighborhood in Rochester. Residents say that's a choice, not an accident. 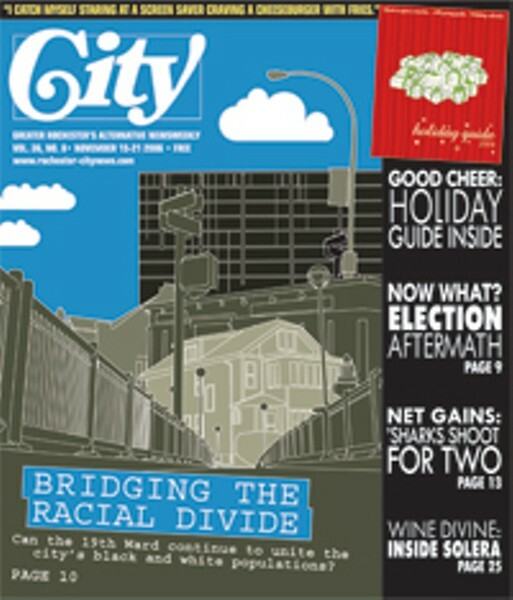 The mission of the neighborhood, according to the 19th Ward Community Association's website, is "to create a conscious multi-racial community where individual and cultural differences are not only tolerated, but celebrated and where people share a sense of community." But the face of the 19th Ward is changing. Rapidly. About 50 years ago, the neighborhood's population was almost 100 percent white. All that changed in the 1960s, when the federal government passed the Civil Rights and Fair Housing Acts. By the 1990s, the 19th Ward had become about 50 percent white and 50 percent black. Since then, white population has been declining, and some wonder if the 19th Ward will soon be almost entirely black. "Is this integration that's here to stay, or is this integration because it's a snapshot in time?" 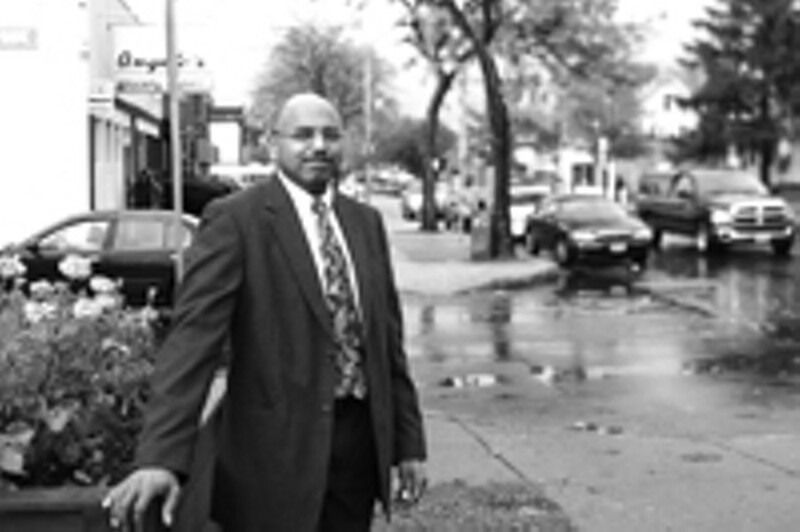 asks Eric Van Dusen, program director at Neighborworks Rochester and a 19th Ward resident. Judging from other Rochester neighborhoods, and indeed urban neighborhoods across the nation, it's only a matter of time before the pendulum swings and the 19th Ward again becomes a segregated neighborhood --- a poor, segregated neighborhood. But part of the reason whites and blacks move into the 19th Ward, says City Councilmember Dana Miller, a longtime 19th Ward resident, is the area's diversity. The 19th Ward, for example, is home to the city's highest percentage of bi-racial couples, he says. And, he adds, children who grew up in the 19th Ward are beginning to start their own families in the neighborhood. 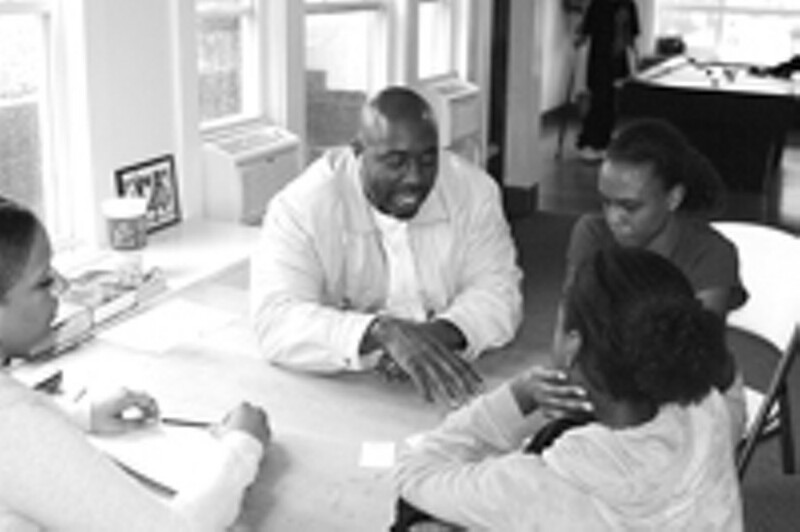 The Community Association's motto is "Urban by Choice." The neighborhood includes upscale areas. Most houses were built around the turn of the century, and many have stained-glass windows, wide porches, and hardwood floors. The 19th Ward tends to attract newlyweds, says Miller. He notes that some houses can sell for as little as $70,000, less than half the cost of a comparable house in the suburbs. And about 1,600 University of Rochester students, staff, and faculty live across the river from the main campus. But a more rugged urbanism marks other parts of the 19th Ward. Violent crime and drug activity have blighted the neighborhood's main commercial arteries, Thurston Road and Genesee Street. The sidewalk cafes and boutiques that line Park Avenue have failed to materialize here, for the most part, and Miller says it's been increasingly difficult to attract larger retailers. Investors, he speculates, are wary of a predominantly black area. "I think there is a racial bias," he says. His comment illustrates the limits to the 19th Ward's diversity. The area around Genesee Park Boulevard tends to have more white residents than do the blocks east toward Genesee Street, which are becoming increasingly black. Within the same neighborhood, there are both racial and economic differences, which Miller and Van Dusen suspect will grow, absent some sort of intervention. True integration, says Van Dusen, doesn't appear to occur on its own. "Is there is a place in this country where it is just naturally happening and holding?" he asks. "I don't know of an example." Historically, though, the 19th Ward has an edge. Residents there recognized years ago that integration wouldn't just happen, and they set up mechanisms to retain the area's racial diversity early on, Miller says. The impetus for the move arose, ironically, from one of the most racially polarizing events in Rochester's history: the 1964 race riots. Blacks began moving to Rochester and other northern cities following World War II. Initially, they came as migrant workers, but many began to establish roots. "They were able to find some jobs and kind of manage to stay here," says Miller, "but the housing was extremely segregated." Prior to the Fair Housing Act of 1968, racial and ethnic discrimination in real estate was legal. "You could legally write a restriction in your deed that the house couldn't be sold to a black or a Jew or anybody else you didn't want it sold to," Miller says. More subtle discrimination was also used. "If you were an African-American family and showed up in a quote, unquote 'white neighborhood' and a house was for sale or an apartment was for rent, unfortunately when you got there it would magically be no longer available." This concentrated blacks in less desirable areas, such as the Third Ward to the west of the 19th Ward, Corn Hill, and the Seventh Ward in Rochester's northeast quadrant. "When you have everybody congregated in those areas," says Miller, "dysfunctional things start to happen. People who owned houses over there said, 'I'll take this single-family house and I'll make it into five apartments.' Or 'I'll take this double and I'll make it into 10 singles.' So you started crowding people." "People were crammed into too-small areas, and that all kind of boiled over in '64," Miller says. The riots were followed by urban-renewal efforts that further displaced black people. And with its attractive housing stock and proximity to their former residences, the 19th Ward was a logical place to go. But a more pernicious trendworked its way into the 19th Ward in the mid-1960s: blockbusting. Unscrupulous real estate agents would convince a black family to move into a predominantly white neighborhood. "Once they had that house on that block owned by the black family," says Miller, "they would go to all the other neighbors up and down the street and say to them either outright, 'A black family just moved in down the street,' or in a little bit more subtle way, they'd have a photograph and say: 'Here's a photograph of a new neighbor that just moved in.'" Fearing that the value of their property would decline, some white homeowners fled to the suburbs. Meanwhile, real-estate agents bought up city houses at rock bottom prices and resold them to blacks with huge markups. That process would continue, says Miller, "until that whole block had gone from being a 100 percent white to 100 percent African American." This was happening not just in Rochester but in cities across the country. In Rochester, however, real-estate agents didn't anticipate the spirit of solidarity that arose in the 19th Ward, Miller says. "A number of people in the neighborhood got together and said, 'We have no problems with the 19th Ward being an integrated neighborhood. We do have problems with the way it's being integrated and the unnatural way that the market's being manipulated essentially to create just exactly what they're telling everybody is going to happen.'" Incensed, residents formed the 19th Ward Community Association in 1964. It is one of the oldest neighborhood associations in Rochester and among the oldest in the country. In 1968, the association secured a cease-and-desist order from the state attorney general's office, forbidding real-estate agents from practicing in the 19th Ward. They then created a volunteer real-estate service, effectively ending blockbusting in the neighborhood. Miller pulls out a map of Rochester delineating city areas by annual household income. The differences are pronounced. Incomes in the 19th Ward range from about $63,000 to $84,000. In the neighboring Third Ward, however, where blockbusting ran its course unabated, average incomes range from $21,000 to $42,000. Now, however, almost 40 years after thecease-and-desist order took effect, the area is about 65 percent black, a 10 percent increase since Van Dusen moved there just seven years ago. Whether the 19th Ward managed to halt re-segregation or merely stall it remains to be seen. And while Census data looks at the 19th Ward as a whole, it's not clear how cohesive the neighborhood is. "There really is diversity throughout the 19th Ward, from my perception, although it's not necessarily the same proportion all through the 19th Ward," VanDusen says. 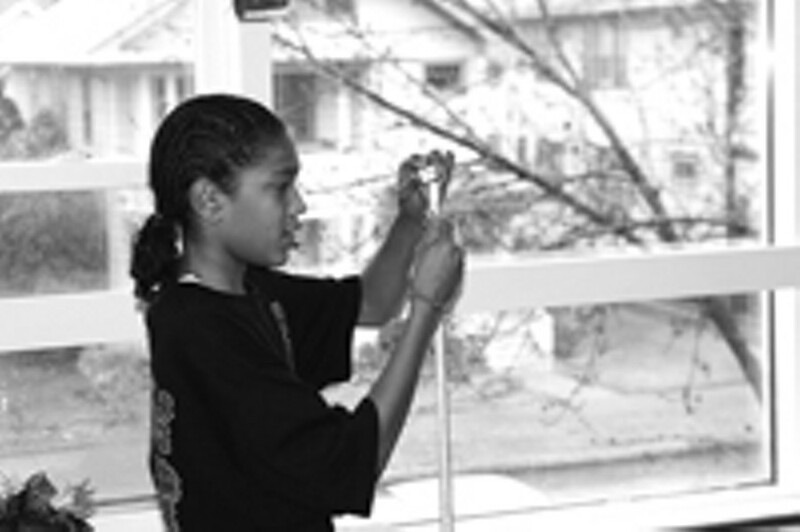 That disparity is evident at the Thurston Road YMCA's TeenCity program for children ages 10 to 17. All the children are black. Few have white friends. And most live within walking distance from the Y.
KareinLangdell, an eighth-grader at the WilsonFoundationAcademy on Genesee Street, says she would be friends with white kids if she could meet any. "There's not really a lot of white people in my school," Langdell says. Ayonna Titus, a seventh-grader at FrederickDouglassPreparatory School agrees. "For every 10 black kids, there's like one white kid," she says. Van Dusen distinguishes between integration and diversity. Diversity, he says, implies mixed races living together, whereas integration implies mixed races living and socializing together. "You can get all the people in the same proximity," he says, "but that doesn't necessarily mean that they're going to integrate." Some of the 19th Ward is integrated, he says, but much of it is not. That's a distinction that another Great Lakes community has spent a long time wrestling with. Shaker Heights, about 20 minutes outside of Cleveland, Ohio, is perhaps one of the most diverse cities in the country. Like the 19th Ward, residents in Shaker Heights resisted blockbusting tactics early on and have struggled to maintain a racially mixed community ever since. But they have taken the movement one step further, using city ordinances to provide preferential housing options for minority groups in certain neighborhoods, and busing students to keep schools racially balanced. "It's not perfect, but it works,"says historian Virginia Dawson, who is writing a book about Shaker Heights. The community, she says, was founded by the Shakers in the early 1900s, and residents resisted blockbusting as early as the 1950s, a decade before the civil rights movement gained full momentum. "The whites and the blacks got together, and they formed this association, and they worked very hard to attract white buyers into the area to keep it balanced," Dawson says. Twenty years ago, Shaker Heights created a nonprofit organization called Fund for the Future, which provides down-payment loans to whites looking to move into predominantly black areas and blacks wanting to move into white areas. Since its founding, says the Fund's executive director, Gail Gibson, the organization has provided about 400 loans. Repayments go back into the organization's rotating fund. "If we didn't need to make any loans, that wouldn't really upset us," Gibson adds. But even more than the 19th Ward, Shaker Heights has a huge housing disparity, with the most expensive houses, in the north, selling for about $1 million and those in the poorest areas in the south selling for about $80,000. That means, says Dawson, that blacks tend to be concentrated in the south and whites in the north. The middle section is fairly integrated. But, adds Dawson, "it's becoming more black than white now." Shaker Height's strongest selling point, most agree, is a school system that consistently ranks among the best in the nation. And it's racially balanced. That's because, almost 20 years ago, the city reorganized its public schools, centralizing students of all races in single junior and senior highs. School district officials also implemented busing in minority communities to maintain racial balance in the city's four elementary schools. A New York Times article from several years ago, however, indicated that the system still has its flaws. Whites tend to outperform blacks, and cafeteria tables during lunchtime remain racially segregated. But most agree that Shaker Heights is leagues ahead of most other school districts in the nation when it comes to racial integration. Wouldn't it be interesting if the 19th Ward could create its own school district,Miller says wistfully. In Rochester, students can select the school they'd like to attend, but waiting lists for the higher performing schools tend to be long. Ayonna Titus says she didn't get into any of the top schools on her list. Shaker Heights' advantage, says Dawson, is that it is a city entirely separate from Cleveland. Overall, she says, the Greater Cleveland area is among the most segregated in the country. MonroeCounty is also highly segregated, ranking among the top 20 most segregated counties in the country, according to the 2000 Census. (There is a caveat, says Van Dusen. Whereas cities in some parts of the US can annex neighboring suburbs, New YorkState banned the practice long ago. "If we could annex all of our surrounding suburbs, statistically we wouldn't look as concentrated in terms of racial groups," Van Dusen says. But, he adds, we would probably still be pretty high on the list). If overhauling the school system to match Shaker Heights isn't politically feasible, though, the 19th Ward may have one advantage: job potential. Spurring economic growth, says Dawson, remains one of Shaker Heights' greatest challenges. Shaker Heights originated in the early 1900s as a planned community, Dawson says. "The whole idea of it was this was going to be an exclusive suburb," she says. "It had no industry. That was the whole point." Instead, the founders placed Shaker Heights on a public transportation line to Cleveland, and focused their efforts on creating a powerful school system. Now, however, Shaker Heights has little room for commercial growth, which keeps property taxes high. Conversely, the 19th Ward, which emerged in the late 1800s, was built around industry, says Miller. Taylor Instruments, which had multiple downtown locations, wanted to build a large factory, and chose the remote location now known as the 19th Ward. The city annexed the 19th Ward in 1902, when annexation was still legal in New York. More factories followed, which led to residential and commercial development. The 19th Ward grew into its own "little village," says Miller, which included movie theaters, ice cream parlors, restaurants, and other businesses. 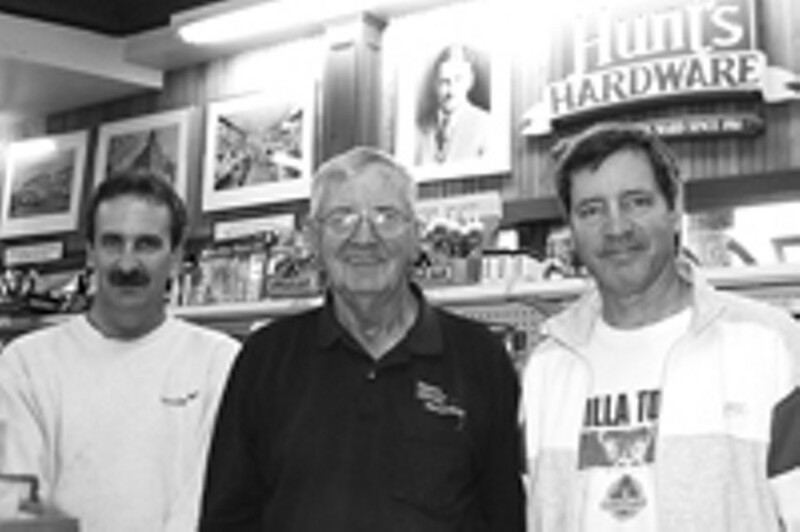 "You didn't have to get off the street to buy anything," recalls Bill Hunt, whose family opened Hunts Hardware in 1914. Hunt has worked in the store for some 60 years. "This street has changed, like all other streets throughout the city," he says. The 19th Ward's retail shops are mostly gone now. Hunt's family has chosen to stay, he says, because the neighborhood needs its own hardware store. Hunt holds up a key. It is long and thin with a jagged edge. It's a skeleton key, used to open bedroom doors a hundred years ago. "Almost every house in this area will have a door that will take this key," he says. But staying on Thurston Avenue has been a challenge. Hunt says he isn't sure when the decline in the area began --- maybe, he says, reflecting, sometime in the '60s or '70s. That squares with Miller's thinking. The 19th Ward, says Miller, was hit hard by the spillover from the race riots, and it hasn't ever really recovered. "We lost a lot of business," he says. "We lost most of the good businesses on commercial streets, like Jefferson Avenue, like Genesee Street, like Plymouth Avenue. On Genesee Street, you had Dorschel Buick, which is now out in the suburbs. Right around the corner from that, you had O'Connor Chevrolet, which is now out in the suburbs. Right next door to that you had Ralph Pontiac, which is now out in the suburbs." But the 19th Ward, says Miller, could be poised for a renaissance. Because as Rochester's manufacturing base has eroded, another economic powerhouse has emerged: the University of Rochester, now the city's largest employer. And that economic giant is located in the 19th Ward's backyard. Rochester is not the only former manufacturing city looking to capitalize on growth in academia. "Now more than ever, higher education is seen as the key to helping manufacturing-based cities catch up and compete in a highly skilled global economy," write Karin Fischer in an article for The Chronicle of Higher Education. She cites cities such as Chicago, Detroit, Philadelphia, and Rochester as examples. Nor can universities afford to become an island in a sea of decay. It was a lesson, says Miller, that the University of Pennsylvania learned the hard way. Located in Philadelphia's notoriously rough west side, the university began pouring money into struggling neighborhoods following violent attacks on people affiliated with the university about a decade ago, Miller says. Julie McWilliams, aUPenn spokesperson, says that initially investors were wary about participating in the university's West Philly Initiatives program. "At first," she says, "we had to take on all of the risk." The university built a grocery store, an eight-theater movie complex, and even its own elementary school. "That encouraged an awful lot of other retail to move in," McWilliams says. Crime in the area has significantly declined since the university introduced its initiatives, according to the university's website. "Overall crime dropped 36 percent in the past five years, with auto theft down 74 percent, robbery down 62 percent, and assaults down 54 percent," it states. Consequently, demand for houses in the area has also been rising. Miller says UR President Joel Seligman flew several Rochester community leaders down to Philadelphia this summer to discuss that university's efforts. "We sat in a conference room in a building that was a former General Electric warehouse. It had been abandoned. The college bought it, completely renovated it. The first floor they use as offices, and the remaining five floors they have luxury apartments there. Luxury apartments rent for $3000 a month," Miller says. "And they did this right on the edge of their campus." But there are marked differences between the University of Pennsylvania and the University of Rochester. Whereas UPenn could no longer afford to idly watch as surrounding neighborhoods fell into disrepair, the UR's location affords it greater luxury. The UR, says Miller, "has a little bit different situation because for much of their history, their argument was, 'We can isolate ourselves successfully from anything that goes on around us. We have a river on one side. We have a cemetery on the other side. We have our medical campus on the third side. And we can block out the fourth." "It was only in the 1980s that they started to come out of that whole island mentality," Miller adds. The first real thaw between the two communities occurred in the early 1990s when the groups came together to build a bridge over the river that connects the campus to Plymouth Avenue. And for more than 20 years, says Miller, 19th Ward leaders have hoped to create a college town at the Plymouth-Brooks intersection --- a project that languished until just a year ago. Upon completion, says Miller, the Brooks Landing Project will house a café, restaurant, hotel, and office complex. The hope, as with most urban-development projects, is that Brooks Landing will push growth into surrounding neighborhoods to reduce blight, vacancies, and open-air drug markets. Creating a college town in the 19th Ward, however, might take more than just a bridge. The GeneseeRiver has been not only a physical barrier but also a psychological one, with the east side home to the haves and the west home to the have-nots. Indeed, as the Brooks Landing project sat mired in red tape, U R students dubbed their new passageway the "bridge to nowhere," Miller says. This schism is true not just of Rochester, but also its surroundings, with wealthier suburbs to the east and more modest ones to the west. So, on a deeper level the bridge between the University of Rochester and the 19th Ward connects not just two communities, but two Rochesters, one rich and the other poor. And, by extension, one white and the other black. While the University of Rochester cannot cross that divide alone, Miller says, it could make the first step. The University of Pennsylvania, he says, invested $1.2 billion dollars in developing its surroundings. "That's about $1.2 billion more than the U of R's put in," he says. UR President Seligman says he, like his predecessors, understands the need to develop the 19th Ward. "We can't any longer afford to think of ourselves as living in an ivory tower," he says. And the university plans to use part of the Brooks Landing office facility. But Seligman's hesitant to talk about money. "I'm not ruling anything off the table," he says, "but I'm not starting in the same financial position that the University of Philadelphia did. We have sometimes made investments off campus. We have sometimes reached the judgment that we can't afford it." Seligman also demurs when asked if the university will actively recruit its guests to visit or stay in the Brooks Landing area. "We anticipate that this is going to be a hotel and restaurant that will be used by the community," he says. "Even if we don't formally direct them, that will happen." But Miller and Van Dusen aren't so sure. Currently, gigantic mounds of dirt mark the Brooks Landing Project. A big sign announces that the dirt will eventually yield a hotel. Nearby rests the future home of Urban Brew, planned as a student-friendly café to be run by the Sector 4 Community Development Corporation. The building is boarded up. It has no big sign. The café's opening date, says Miller, has been pushed back to the spring of 2007. The 19th Ward cannot fix itself by itself, Miller says. It's not just a matter of money, but perception. People, he says, must see the 19th Ward as a desirable place to visit and live. The University of Pennsylvania, says Miller, took charge. "The point is that the university played a very active role in making (change) happen," he says. Economic and racial integration, he continues, requires constant, leveraged support. "Integrated neighborhoods are still relatively rare in America," Miller says. "You have to be active in how you create and how you maintain an integrated neighborhood. It's not just kind of a passive thing that happens." The 19th Ward Community Association holds its annual convention this Friday, November 17. The event, which will include the election of officers and an auction, will be held at the DanforthCommunity Center, 200 West Avenue, beginning at 6 p.m.